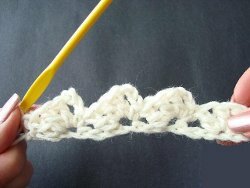 Follow this step by step tutorial to learn how to make a crazy shell stitch. You first begin in a chain with multiples of three, but you'll read that in the tutorial. Don't be fooled by its name, this crochet stitch isn't too crazy, but it's a bit different from the regular shell stitch. 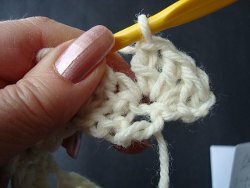 You will definitely want to learn this beautiful stitch. 1. Begin with a chain, in multiples of three, plus one extra. For example, 15 plus 1, or 18 plus 1, or 21 plus 1. 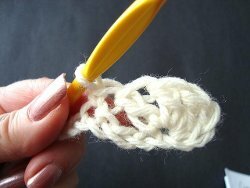 Make 3 double crochet in the 4th stitch from the hook. 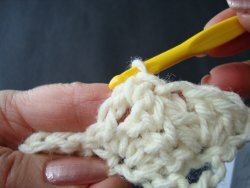 Skip the next 3 stitches, single crochet in the next stitch. 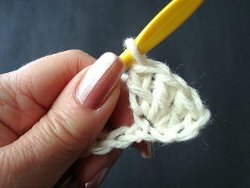 Make 3 double crochet in the same stitch, skip the next 3 stitches, single crochet in the next stitch. Repeat from * across the row. 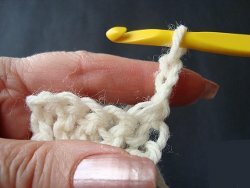 End with a single crochet. 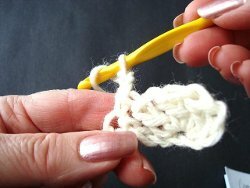 *Chain 3, make 3 double crochet in the same chain 3 space. Single crochet in the next chain 3 space. Repeat from * across the row. 3. Repeat the 2nd Row until your achieve the required size of your project. Thank you very much for that crazy shell stitch. I needed a nice edging for an afghan I crocheted and this is perfect. Your instructions were very easy to follow. I found a fabulous afghan made with 70s colors, and this is the stitch that was used. Thanks! I have a question. I like this stitch and would like to know how to make a last row (say on an afghan) that would be straight just like the beginning chain row. In other words not to have one edge straight the beginning and then have the other end have these sticky outty clusters. hope I am being clear in my question. This is the stitch my Grandmother made all of the lapghans that she handed down in. 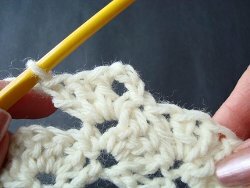 I've used it for years as "Grandma's Stitch"--I think it's funny that it's called the Crazy Shell Stitch...but it crochets up fast and makes a warm blanket. This was the very first stitch I learned how to do when I was 11yrs old, my bestfriend's mom taught us when I was living in Hawaii and that was over 35yrs ago...I miss those days, it was our summer project! I LOVE THIS PATTERN !! I AM GOING TO MAKE AN AFGHAN WITH THIS STITCH. THANK YOU. 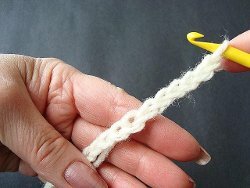 I have been looking for a long time for the instructions on how to make that stitch . Thanks so much! I would like to know did you start from top or bottom. I have a old hat made of that stich but can't get it to gather. I love this stitch. I've made it in solid colors, multi colors and even two different colors together. It always looks great. I love that Ms. Harrington started with how many multiples for the length you need (e.g. three plus one) as I never know how many to start with and have to begin over and over till I get it right. Thank You! 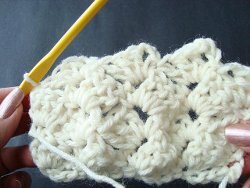 This stitch is also known as a "sleepy" shell stitch. Leisure Arts book "Quick and Cozy Afghans" 1994 features a baby afghan with blue sleepy shells alternating with rows of white double and single crochet....it's absolutely beautiful and easy to make. It is edged with blue "fan" stitch. Very helpful again. Thank you!